We have a yahoo group! 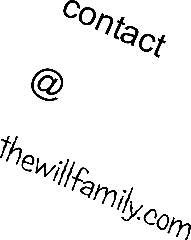 If you are part of the Will family, then you can join. We have photos, stories and other great Will family items in our group. When you join, let us know how you are related so that we can validate your membership. We used to have a website, but we didn't update it much. We're starting over in April 2008 with this new site. This website hopefully will also have links to websites of some of the above descendants and their news. We also hope to create some type of online group (maybe using yahoogroups.com) so we can all share stories, files, and photos in a protected and private online environment.